A 26-year-old female was presented with the history of dyspnea and giddiness since 1 month. There was no history of palpitation, chest pain, and constitutional symptoms. Two-dimensional echo revealed that there was a left atrial (LA) mass and severe mitral stenosis (Mitral Valve Area-0.5 cm2) with normal ejection fraction. Provisional diagnosis was LA myxoma. Patient was taken for surgery, after establishing full flow on cardio-pulmonary bypass machine left atrium was opened. There was LA mass of about 7 cm × 5 cm attached to posterior mitral leaflet annulus and beyond annulus extending in left atrial appendage (LAA) obstructing mitral valve [Figure 1]. 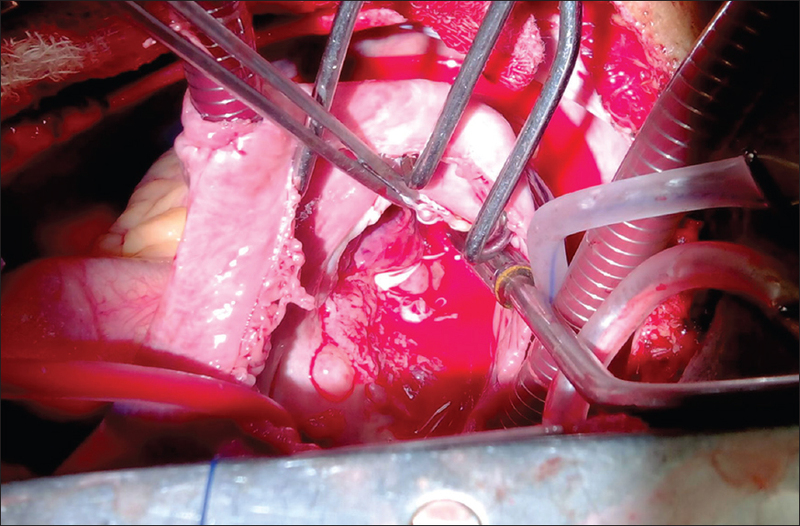 Complete excision of the tumor was not possible, so the tumor was removed without sacrificing the mitral valve. The patient had uneventful post-operative recovery. Histo-pathological examination [Figure 2] revealed that the tumor was highly cellular and composed of sheets and bundles of pleomorphic spindle-shaped cells admixed with round and polygonal cellular areas showing markedly pleomorphic nuclei with predominant nucleoli and indistinct borders. At some places, the neoplastic cells were arranged concentrically around blood vessels. Large area of necrosis, myxoid changes, and focal infiltration was also present. The mitotic activity was very high (3-5/hpf). On immunohistochemistry, the cells were immunopositive for cytokeratin, viamentin, mic-2, and bcl-2. There was focal immune reactivity for CD 34 and calretenin; the cells were immunonagetive for CD 31. Post-operative chest and abdominal computed tomography (CT) study were normal. Patient was referred to oncology department for further chemo-radiotherapy. After 1 month patient attended the pain clinic with complaints of pain and weakness over lower back and both lower limbs. Magnetic resonance imaging dorso-lumbar spine showed metastasis to D 8 and L 2 vertebral bodies. 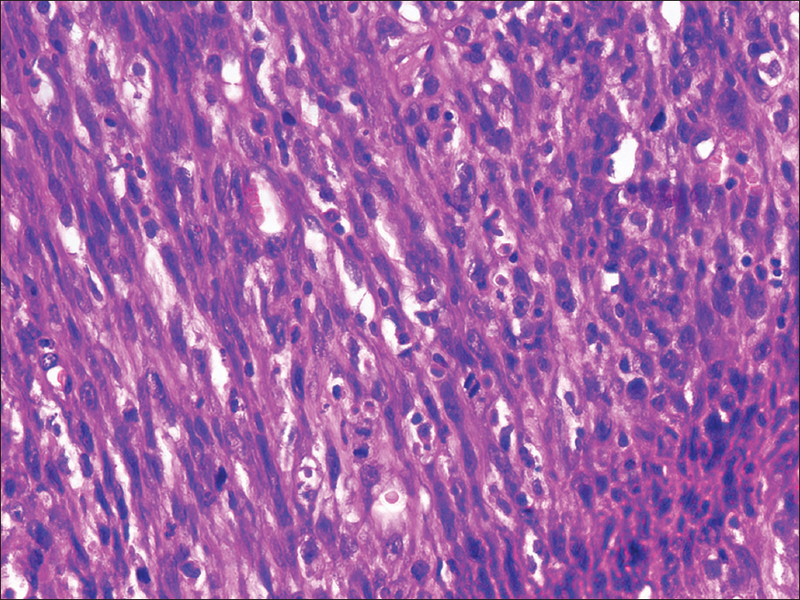 Although cardiac synovial tumors are extremely rare tumors, they should be kept in differential diagnosis with myxoma, mesothelioma, and fibrosarcoma. Intra-operative frozen section should be done, but careful sectioning immunohistochemistry and molecular genetics studies are the key for correct diagnosis and better treatment outcome. Kumar S, Chaudhry MA, Khan I, Duthie DJ, Lindsay S, Kaul P. Metastatic left atrial synovial sarcoma mimicking a myxoma. J Thorac Cardiovasc Surg 2004;128:756-8. Varma T, Adegboyega P. Primary cardiac synovial sarcoma. Arch Pathol Lab Med 2012;136:454-8. Nicholson AG, Rigby M, Lincoln C, Meller S, Fisher C. Synovial sarcoma of the heart. Histoathology 1997;30:349-52. Winkler B, Grapow M, Seeberger M, Matt P, Aulitzky W, Eckstein F. Heart failure resulting from giant left atrial synovial sarcoma metastasis. Thorac Cardiovasc Surg 2012;60:84-6.